Canberra is a hub for all things visual. Tegan Garnett has handpicked six Canberra artists to watch in 2018. Also this year, Quinlivan ran two major exhibitions in Canberra. The first, Anatomy of a Drawing, was held in Gallery 4 at Canberra Museum and Art Gallery. The other, Transition, was an auditory drawing performance at the National Portrait Gallery, created in collaboration with Rachael Hilton, Louise Keast, Shikara Ringdahl and Alex Hobba. “It’s been a real thrill to do some work back in my hometown”. 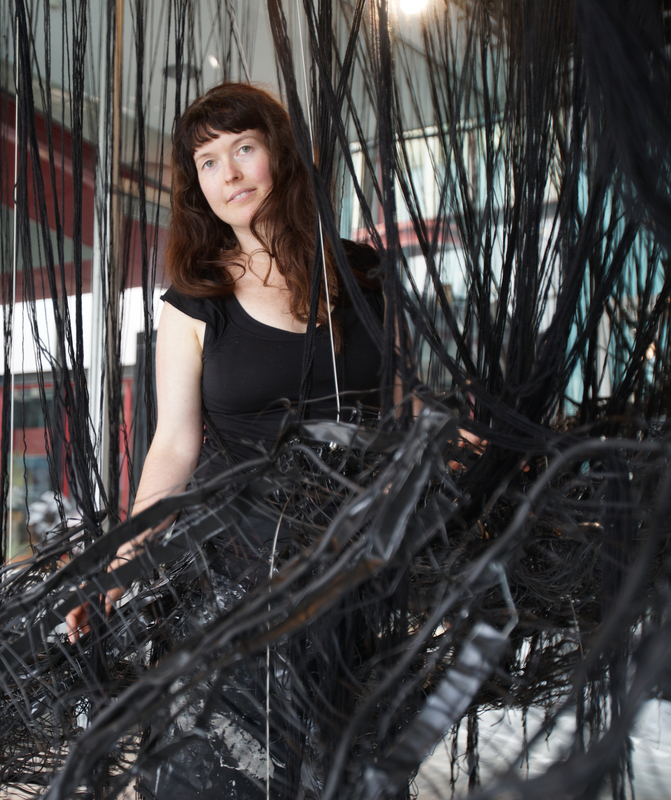 She received recognition from the Canberra Critics Circle in November with a Visual Arts award. This year has been full-on for Quinlivan, who was involved in several exhibitions and residencies overseas, and started the year off working as a studio assistant for Berlin-based artist Chiahru Shiota. After assisting Shiota in installing a large-scale installation in Paris, she undertook a residency at the Centre for Art and Urbanistics in Berlin. She then installed a large spatial drawing in the Project Space at Hong Kong Art Central, and was a visiting artist at Colorado State University in the US. After such a packed year Quinlivan is enjoying spending a few months back home in Canberra, gathering her thoughts and beginning a new series of works for next year. Her next big Canberra-based project for is working on the art for the Capital Metro light rail system. “I was very fortunate to be selected to produce a series of drawings that will be integrated into each of the thirteen stops that punctuate the new line from Gungahlin to the City. I’m very much looking forward to seeing these appearing over the coming months.” Additionally, Quinlivan will be holding a solo exhibition in New York City in March next year, her first exhibition with Jankossen Contemporary in Chelsea. Thus, Hannah Quinlivan’s next few months will be occupied putting together a new body of work, initially here in Canberra before moving to a studio in Brooklyn. Nastja Zarić is a Canberra-based crafter and designer who runs her independent jewellery line ZARIĆ. The daughter of a jewelry designer mother and a ceramic potter father, Nastja was exposed to the two crafts during her childhood as both parents had spacious studios in the family home. Although it was not a calculated decision to combine the crafts of her parents & create something new, this organically started to come together over the past two years. With the inspiration from her parents, Zarić’s interpretation of the art of these two crafts and knowledge combined, manifested as her jewellery line ZARIĆ. “Learning about silversmithing, glazing and gemology is really wonderful. 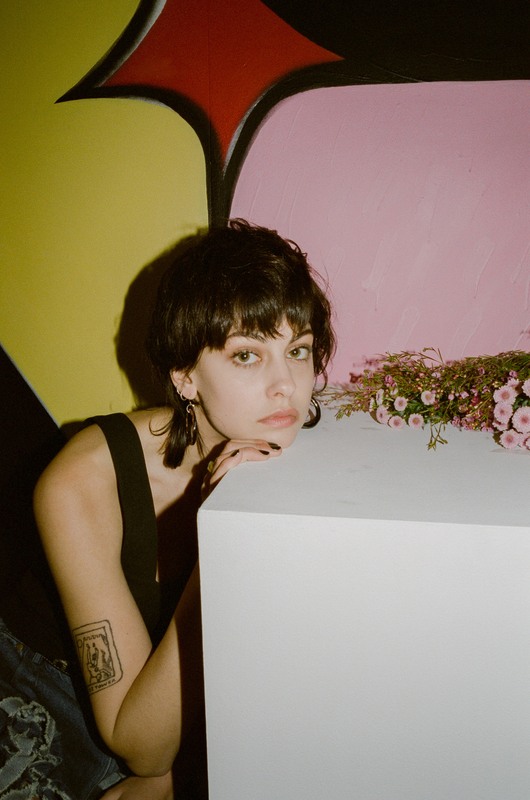 It’s also important for teaching when it comes time to build my team or outsource findings.” Zarić currently crafts all the pieces for her jewellery line in her Braddon studio, with the help of an intern over the past few months. All the hooks, studs and hoops are handmade in Sydney by a local silversmith using recycled sterling silver. Sourcing materials that are designed with intention is really important to Zarić. Working with earth driven clay, silver, gemstones and recycled leather, her own values become apparent through her sustainably produced work, shaping the ZARIĆ line to produce handcrafted, conscientious, quality pieces. This year Zarić has spent time in Bali practicing silverwork, and California practicing ceramics. In late march this year, Zarić launched her third collection of solo work, and in this past week released the Summer SS17 collection. Nastja Zarić’s work is available from her open studio in Braddon on Lonsdale Street, as well as from her website and boutique stockists. Hannah Axelsen is an up-and-coming local artist who recently graduated from ANU with a Bachelor of Visual Arts, majoring in Photomedia. her favored medium to date is photography, however she maintains a keen interest in mixed media art. The key themes underpinning Axelsen’s work are those of nostalgia, the environment, suburbia, and sense of place. She combines traditional practice, such as large and medium format film photography and painting, with digital photography, giving her work intrigue and a unique quality. Axelsen first took an interest in photography as a child when her mother gave her a point and shoot film camera. “I used to pretend to take photos even though it wasn’t loaded with film”. She started shooting properly in high school with her father’s old Olympus OM-1, from which burgeoned a love for analogue photography. Axelsen regards her older sister as a significant influence, whose exhibitions she remembers from her childhood, and first inspired her to take photos of architecture and buildings from a front-on angle. Axelsen’s passion for medium format film colour photography blossomed at university. 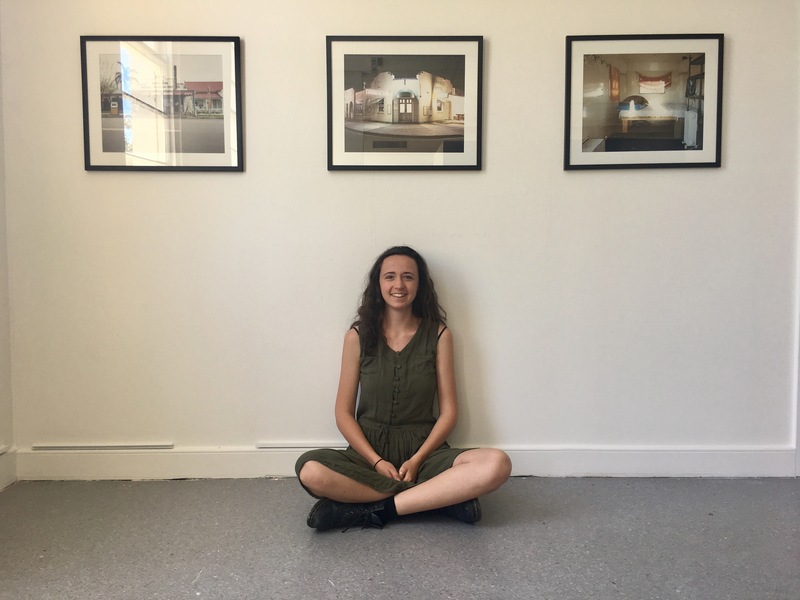 During her degree she focused on photographing Canberra houses at night, documenting small Australian towns and documenting the Australian environment. She attributes Stephen Shore, William Eggleston, Joel Meyerowitz and Todd Hido as major inspirations for her style. Emerging out of this influence is Axelsen’s interest in documenting houses at day and at night, working with colour film in the darkroom, and night photography. In 2015, Axelsen particiapeted in a trip to Japan to assist artists in constructing a sculptural hut, as part of an arts festival. Much of her style and perspective on the landscape is inspired by this trip, along with travelling Europe and coastal and regional Australia. In 2016, Axelsen participated in the ANU graduating show at the School of Art, and a group exhibition at the Front Gallery. For her final piece at university, Axelsen’s major project was a photobook named The Drive, which consisted of photographs taken with a Mamiya RB67 Medium format camera with colour film. This year Axelsen took part in the exhibition, Around Balawan, at ANU Art School’s Photospace gallery. For this exhibition she partook in a fieldtrip to Mt. Kosciuszko and the southern coast of New South Wales, producing a seven-piece series. In October, Axelsen was selected as a finalist in the 2017 Inner North Prize held at The Front Gallery and Café. For this exhibition she collaborated on a series of four mixed media pieces with a friend and poet. Axelsen’s inspiration for 2018 stems from an awareness of issues concerning the environment, inspiring her to conserve and protect it. Friends and family are also inspiring her, as are small coastal and inland Australian towns and their aesthetic. In 2018 Axelsen will commence Honors at the ANU School of Art where she plans to continue with her concepts around Australian towns. Axelsen is also planning an exhibition in Canberra late in the year after traveling. Keith Marshall is a Canberra frame builder, who crafts beautiful, specially commissioned handmade and steel bicycle frames. “I work in steel as it is a tough but highly formable material that when turned into a bicycle frame rides beautifully.” The steel frames Marshall crafts are cut, carved, turned, melted, bent, polished and more, as his chosen medium is both non-toxic (unlike carbon fiber) and is repairable. Framebuilding is an old art. Marshall’s artistic process begins with a specific, very light steel tubing and various other raw materials; cast lugs, steel bar, etc. 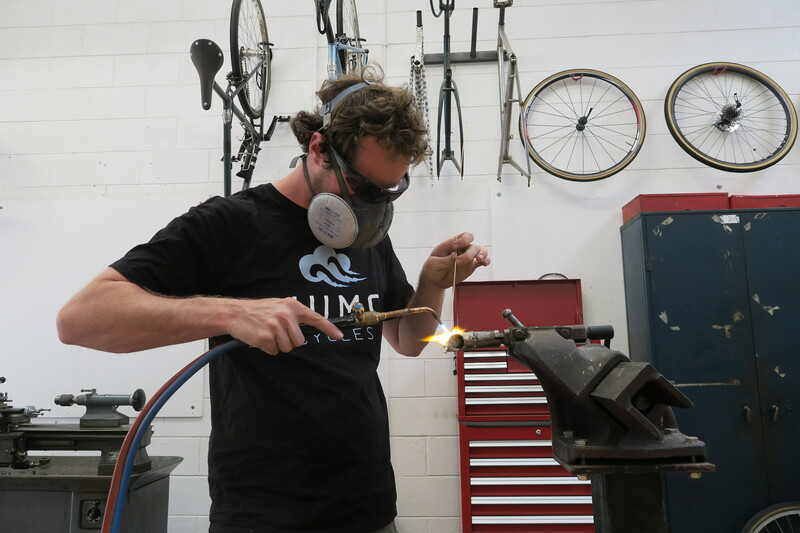 Forming and machining the parts to create the structure of the bicycle, he then brazes elements of the frame together with an acetylene flame and wither brass or silver as the joining material, depending on the bike’s desired function and finish. Marshall’s favorite bike to build is one of his own designs. It is a bike designed to traverse rough dirt firetrails, and handle tracks and scrubby paths that snake through the Australian bush. This bicycle design is inspired by Marshall’s own passion for spending days out riding and camping, exploring new and wonderful parts of his country. This year Marshall has been working through a long order list of bespoke and highly detailed custom frames, for customers all around the world. Most of his bikes are sold in Australia, however he this year started selling his creations to Japanese enthusiasts. Keith’s inspiration in 2018 will being a change of place and pace, as well as living more closely with the bush as his new workshop will back right on to national park. 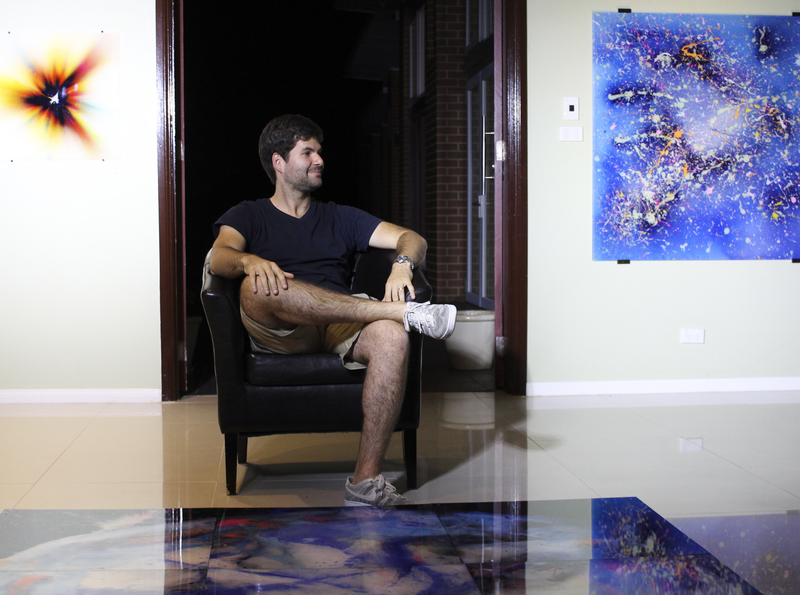 Tommy Balogh is a Canberra-based photoluminescence artist, whose works are popping up all around Canberra. A graduate of the ANU School of Art, at university Balogh focused the idea of the organic form. Essentially, he sought to explore the basic dynamics of what makes up abstract art. Balogh’s passion for photoluminescence began circa. 2014-15, a choice of medium that developed out of the exploration of its possibilities. He asserts that the full potential of his work was realised with the involvement of lights, creating for him almost a new medium. His 2016 exhibition VOYAGE was the turning point that demonstrated Tommy’s work at scale had a heightened impact on the viewer. Adding lights and music to the paintings unlocks a sense of duality, of pulsing movement, breathing, and an element of unknown life. Tommy found that with the addition of light and sound, his art now questioned perception and the way that a single piece can become more than just one painting. Prior VOYAGE, Balogh participated in Art Not Apart 2015, showcasing his work ‘The Three Disciples’. In 2016 he occupied a space at City West car park to exhibit and create, leaving his artistic mark on the elevator doors. Tommy completed a residency in Germany 2016, which resulted in a projection of his work inside a German cathedral. This year Balogh showcased his first sculptural work, ‘Pyramid’, at Art Not Apart 2017 (which now resides at ANU pop-up village). Late this year he exhibited Oasis at a Manor in Chapman, a collection comprising of at least two years’ worth of work, and thus a spectrum of work that demonstrates different periods of the artist’s life. Balogh plans a 2018 series dedicated to works with dark central forms, or what he terms “points of singularity”. This is created through new techniques using tools that he will be exploring next year, thinking about how to incorporate new ideas, and giving special consideration to colour relationships. He plans an exhibition in the new year in Canberra, as well as installing ‘The Three Disciples’ in New Acton. Clare Jackson is a Canberra based printmaker. Her chosen medium of etching gives her work immediate recognizability in the Canberra arts scene, and also allows her to achieve atmosphere in a unique way. Jackson began etching at ANU during her print media and drawing degree. A residency at Megalo led from her honors in etching at ANU, and the chance to explore new etching techniques and different ways to transfer her vision from abstract ideas to paper, using copper plate. Jackson’s printmaking process is very intricate. It begins with a ‘hard ground etching’, where the copper plate is covered in an acid resistant medium and a drawing is carved into the surface of the plate with a needle. These fine lines cut through the acid resistant material, exposing the metal underneath. The copper plate, with patterns of vulnerable metal, is placed in acid and the drawn lines are eaten away, now permanent on the plate. Jackson uses different variations on this process to achieve desired patterns on plates with different techniques. Finally ink is applied to the copper plate and, like an inside-out stamp, the paint seeps into the grooves of the plate. Placed onto paper and pushed through a press, the image is printed, and multiple plates are used to create detail and depth. Jackson prefers to use smaller copper plates that she can carry around. Walking the streets in the evenings, she draws on the plates, capturing scenes of houses, shadows and light that appear at the twilight hour. She sees printmaking as a way of cataloguing and preserving moments in history, creating almost an archive of time spent interacting with her environment. This year Jackson’s This Is Not A Place series was a part of the Shake It Up exhibition at Nishi Gallery for Art Not Apart 2017. The series is Jackson’s response to the Mr. Fluffy cases in homes around Inner-North. Her midyear exhibition at Megalo studio was the combination of three series’ tied together: the Blue Nights series (left), inspired by houses at nighttime along Woy Woy Bay, Space Capsules, inspired by freeze frames of NASA film depicting capsules retuning to earth after a period of space travel, and This Is Not A Place. In 2017 Clare also exhibited with an all-female group of artists for the Belly exhibition at Watch This Space Gallery in Ciccone, Alice Springs. 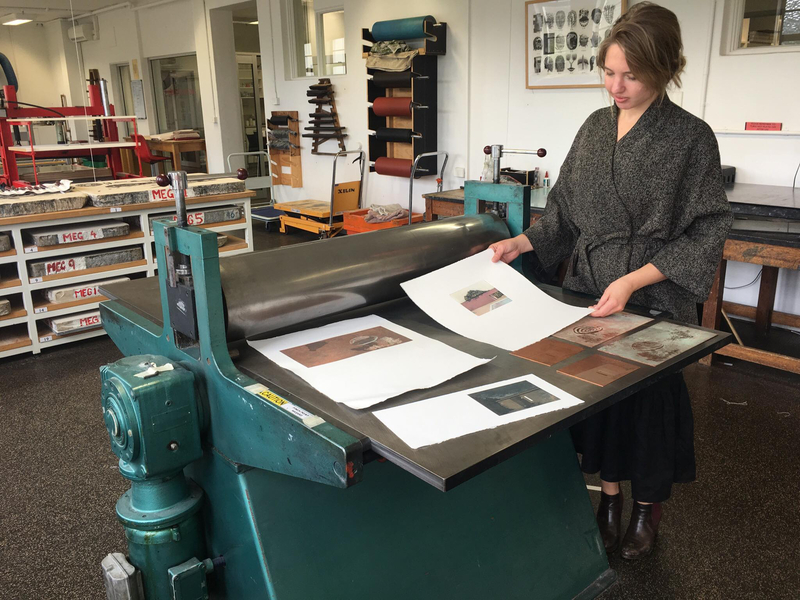 In August Jackson undertook a residency in print making at Vermont Studio Center America. While she was away she was in two print prizes, one at Freemantle Arts Centre, and one in Queens Cliff Gallery and Workshop. Clare Jackson already has an exhibition planned for February 2018, at Form Gallery in Queanbeyan. Over the summer she will retreat to a studio in Woy Woy to gain inspiration and ideas for her next piece. Additionally, Clare has another residency planned for 2018 on a small, traditional island in Brazil where she will focus on ceramics and printing.